The CNRS finds applications for the results of its research laboratories. As a leading research player at the heart of scientific, technological and societal challenges, the organization provides businesses with solutions for innovation. "CNRS, driving research in the world" A film directed by Nicolas Mifsud, CNRS Images, 2015. Music: "Know How" by Elisabeth Skornik - Guy Skornik, with the kind authorization of Frederic Leibovitz Editeur. Photographs: CNRS Photothèque. The CNRS helps bringing projects with strong innovation potential to fruition. It concentrates its efforts, both at the national and international level, on key fields of expertise, or “CNRS Transfer Focus” areas. From startups to multinationals, the CNRS offers an array of solutions to help companies develop their R&D capacity. It works closely with industry through about a hundred public/private research units. The Watchfrog startup commercializes tests using amphibian larvae and fish, which become fluorescent in the presence of endocrine disruptors that interfere with thyroid or sexual hormones. As a driver of economic growth, the CNRS takes pride in the launch of more than 1,000 innovative companies (Innoveox, SuperSonic Imagine, WatchFrog, etc.) since 1999. It provides support for entrepreneurs at every stage of the startup process, through consulting and coaching, simplified administrative procedures, tailored financial conditions and equity investment through CNRS Innovation, its subsidiary dedicated to industrial applications. In addition, the CNRS participates in the development of a seed capital fund for the benefit of innovative startups. The CNRS guarantees the protection of its laboratories’ results. Its Innovation and Business Relations Department (DIRE) registers patents, signs licensing agreements and supports the creation of innovative businesses with CNRS Innovation and the technology transfer companies (SATTs) in which the CNRS is a shareholder. 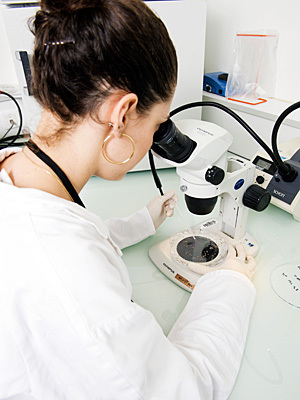 Each year, the CNRS gives access to its laboratories and technological platforms for short training sessions in key areas. Its experts also provide training at companies’ premises. The CNRS services, including consulting, expertise, assessments, publishing, thesis supervision and laboratory experience promote interaction between researchers and industry on innovative projects. "Start-up Connexion" calls for proposals. The CNRS Innovation and Business Relations Department (DIRE) monitors and facilitates the cycle of innovation. It coordinates 300 technology transfer professionals, 18 CNRS regional partnership and technology transfer departments, and CNRS Innovation, a subsidiary dedicated to industrial applications, managing the CNRS patent portfolio and negotiating operating agreements. The CNRS also relies on the local action of the 14 technology transfer companies (SATTs) in which it is a shareholder. Each year, the CNRS allocates €18 million (excluding payroll costs) to technology transfer. "Innovation Research Industry" A film directed by Nicolas Mifsud, CNRS Images, 2015. Music: "Nothing is impossible" by Thierry Caroubi, with the kind authorization of Frederic Leibovitz Editeur. Photographs: CNRS Photothèque. This data was first published in the "CNRS a driver of innovation" brochure, dated September 2015.